In 1968, Eugene Simchak, his wife, and their four children moved into their new house in Mount Pocono. A short time later his friend from work at Tobyhanna Army Depot, Joseph Hametz, called to say that the priest from Saint Mary Byzantine Catholic Church in Taylor, Pennsylvania, would be coming up to Pocono Summit to celebrate a Divine Liturgy at Saint Joan of Arc Roman Catholic Church. So the Hametz Family, the Simchak Family, Mrs. Julia Polanchock, and Father Sergius Bachkovsky gathered for that first Byzantine Catholic Divine Liturgy celebrated in the Pocono Mountain region of northeast Pennsylvania. This was the humble beginning of what would eventually become Saint Nicholas Byzantine Catholic Church in Pocono Summit, Pennsylvania. The small group of loyal Byzantine Catholics began to grow and to meet regularly at Saint Joan of Arc Roman Catholic Church for their Sunday liturgies. In 1972, Fr. Sergius was transferred and his successor at Saint Mary's in Taylor, Fr. Hal Stockert, continued to make the trip to Pocono Summit every Sunday to serve the growing parish of Byzantine Catholic faithful. When Fr. Stockert was transferred in 1974 Monsignor (then Father) Stephen Zajac from Saint Nicholas Church in Old Forge, Pennsylvania, took over the responsibilities of administrating this church community. Shortly afterward, Saint Joan of Arc suffered a damaging fire and a new place of worship had to be found for this young Byzantine Catholic community. A little red schoolhouse serving as the community center for residents living at the nearby Pocono Manor Resort was leased in 1974 by Monsignor Zajac for Sunday Services. When the opportunity arose, and with the blessing of Bishop Michael Dudick, Monsignor Zajac purchased the building in 1976 and it was officially named Saint Nicholas of Myra Byzantine Catholic Church. There was no heat, no running water, and no bathrooms. California iconographer Mila Mina was enlisted to help in the remodeling of the inside of the structure by covering the walls with icons of the prophets, saints, and the major feasts in the Byzantine Catholic church year. Assisting Monsignor Zajac in providing liturgical services were Byzantine Franciscan priests from the Holy Dormition Friary in Sybertsville, Pennsylvania. Among the priests who came to help were Fr. Anthony Skurla (the uncle of our present Bishop William Skurla), Fr. Marion Kawola, and then Fr. Basil Schott, who is our present Metropolitan Bishop for all Byzantine Catholics in the United States. I'm still told by some of those early members that one wintry Sunday it was so cold when Fr. Basil came up that he set a new record for how quickly the Byzantine liturgy could be celebrated. When a 5 ½ acre parcel of land along Route 940 in Pocono Summit became available in 1980, it was purchased and plans for moving the building were set in action. 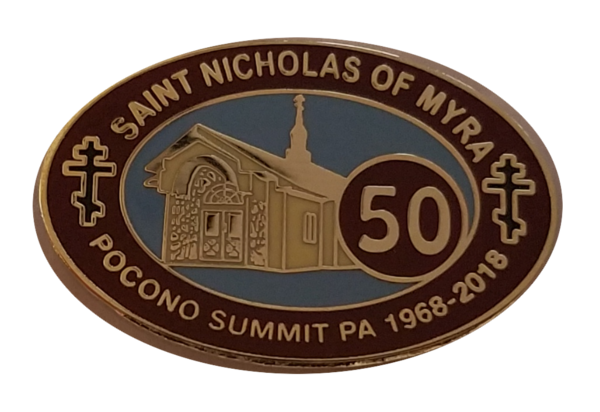 A foundation was prepared and on September 21, 1981, the main highway into the Pocono Resort area was closed while, escorted by local police, the community center building was physically lifted and moved one mile from Pocono Manor to its new location in Pocono Summit. Pictures of the event show the utility company trucks lined up to lift low hanging wires so that the church could pass underneath! The new foundation was built in such a way that a small church hall was added to the structure. A small shed to house the oil furnace to provide heat in the winter was also added to the structure. There was still no running water or restrooms so a portable latrine was rented and placed at the back of the building and parishioners brought water in gallon jars. A Saturday flea market was established in the unfinished hall and this would provide a significant fund-raising boost for the church. During this time Bishop Michael Dudick established the Carpathian Village/Saint Nicholas Shrine eleven miles away in nearby Canadensis. This facility, located on 82 acres, serves as a spiritual renewal and recreational center for the Byzantine Catholic Eparchy of Passaic. Fr. Paul Tigyer was assigned as the first Director of this facility and his name was also added to the list of priests assisting Monsignor Zajac with the liturgical and sacramental demands at Saint Nicholas Church. Since all seminarians for the Eparchy were required to work during the summer at the Carpathian Village, many of the priests ordained from 1980 through 1995 also helped out at the Pocono parish. Fr. Tigyer retired in 1995 and his successor, Fr. Michael Salnicky, ordained in 1993, became the next name on the list of those priests helping Monsignor Zajac. Shortly after this the Eparchy of Passaic received a new shepherd in the person of Bishop Andrew Pataki upon the retirement of Bishop Dudick. In June of 1997, Monsignor Stephen suffered a debilitating stroke and was called to his eternal reward on October 10th. Fr. Michael Salnicky was assigned by Bishop Pataki to replace Monsignor Stephen as Administrator of Saint Nicholas parish. It is interesting how external events can affect the life and growth of a parish and just such an event occurred the next year, 1998, when the Coolbaugh Township supervisors passed a law that portable latrine units cannot be located in a permanent location. Violators (including Saint Nicholas Church) were given thirty days to correct the situation or apply for a temporary one-year extension. Otherwise they had to cease operations and pay a hefty fine. At the next Township meeting, Saint Nicholas Church petitioned for the extension of time. One of the supervisors vigorously rejected the petition and muttered that if the Church was unable to comply then the Township should, "Shut 'em down!" Fortunately, the microphone was on and picked up his comment at which point another supervisor quickly responded, "They are a church! You can't shut a church down!" The crowd present also heard the comment and rallied to the side of this courageous councilwoman in support of Saint Nicholas Church. The vote was taken, the extension granted, and now the real work began. It makes one chuckle to think that the complete expansion and remodeling of the church was initiated by a Township ordinance requiring indoor plumbing! Within the next year a site plan was developed, blueprints drawn up, and the renovations began. The expansion included a new well and septic system, two new restrooms, a new kitchen, expanded Sanctuary, sacristy and vestibule areas, and a new basement with room for an office, mechanical room, and religious education classroom. The hall was finished, equipped with heating and air-conditioning, and became the center for parish social activity. The basic structure layout was not significantly different when viewed from outside but there was substantial improvements on the inside. With the new renovations the parishioners began an active baking program, which continues to this day. There was also room now to hold various parish functions and fundraisers. When the zoning extension ran out, the new building was opened and operating according to code. Improvements continue to be made including expansion of the parking area and an illuminated sign marking our presence on the main thoroughfare. But a church is not just the physical building - it is the families and individuals who persevere in faith, stewardship and hard work to make a parish what it is. In addition to the expansion of the physical structure, our parish has continued to grow in membership and now has a firm foundation of Byzantine Catholic faithful who delight in sharing their Byzantine Catholic faith with those vacationing in the Pocono Mountains of Pennsylvania as well as inviting new residents to experience the Catholic Church in the spiritual heritage and traditions of the Christian East. Outreach programs to the community have been established and Saint Nicholas of Myra has become well known in the region. We are truly a "Welcoming Catholic Community!" In conclusion, we are thankful to God and for the intercession of our namesake, Saint Nicholas of Myra, for all the blessings our parish has received these last 40 years and we look forward to the future growth of the parish as we celebrate and share our Catholic faith and Byzantine Catholic traditions with all who find themselves at our door. We also extend our prayerful appreciation to those priests who more recently provided service to our parish family, especially Fr. Thomas Sable, SJ, and Fr. Nicholas Kraynak. May God grant our parish family, the clergy who have served our church, and all our visitors and their families peace, health, and happiness for many blessed years. Na mnohaja i blahaja l'ita!